Business budgets are essential things to help keep a business running and make it more successful, and the following templates will help you achieve just that. 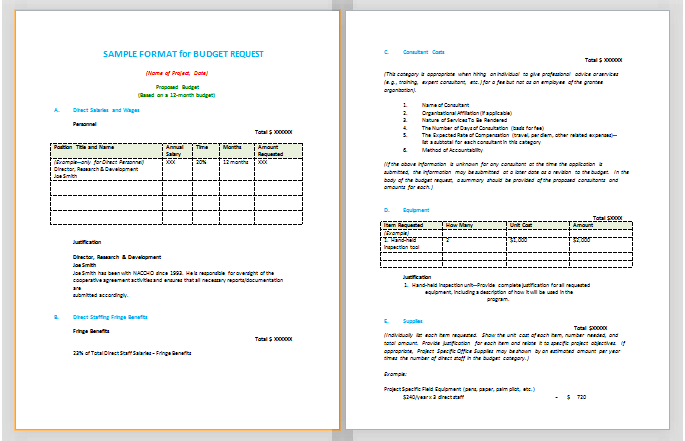 The sample Proposal format (template) is rather simple and can be edited according to the specific needs and/or wants of your business. At the top will be listed the name of the specific project being performed, as well as the date work began. Next will be a section where the direct salaries and other wages of personnel involved with the project will be listed, as well as the amount requested by these individuals for working on the project. Underneath these columns will be listed a statement of justification, which will explain why the project manager feels that a certain individual would be a great fit for assisting with the project at hand. Next will be a list of any fringe benefits that those assisting with the project may receive, if any. After this comes a detailed consultation cost list, which includes the consultant’s name, company, services that they will provide, etc. After this list will be a section detailing the cost of any equipment that will be used, followed by the total cost of supplies for the project.